I’ve always loved the concept of time travel. One of my favourite movies is Back To The Future. I loved the crazy professor , the DeLorean time machine, and the “flux capacitor” which magically made the time machine work. I also loved how neatly interwoven the past and present were, and how, when Marty McFly returns from the past, the present has been altered because of his actions. So when I began writing Asher’s Dilemma I thought I had time travel all sorted out in my head. Turns out, once you accept that time travel is possible, the door is opened to all sorts of mental gymnastics. I spent hours pondering the various scenarios, wondering what would happen to X if Y did this to him in the past? Would X disappear? Be wiped out from history? Travel to another dimension? (3) There are multiple co-existing timelines. Even after I’d chosen my model, I had to work out my storyline to fit in with it. Many roundabout arguments with myself and headaches ensued. Every now and then I had to remind myself that I was writing fiction, not a scientific thesis! It’s a strange experience striving to be logical about something that is unproven, illogical, and—most people would say— impossible. 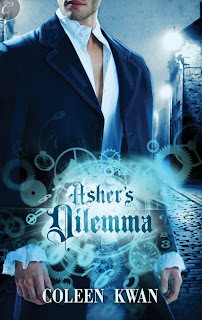 Hopefully, readers will enjoy Asher’s Dilemma, time travel glitches not withstanding.